Bluetooth, Blind Spot Assist, Remote Start, Rear View Camera, Touchscreen! This reflex silver metallic SUV has an automatic transmission and is powered by a 3.6L V6 24V GDI DOHC engine. Driven via that strong motor it gets 13.7 L/100 km in the city and 10.1 L/100 km out on the highway according to Transport Canada. 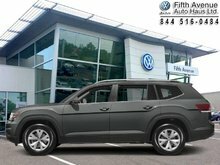 Our Atlas's trim level is Comfortline 3.6 FSI. Upgrade to the Comfortline for some extra features and comfort. 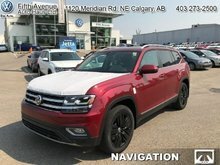 It comes with 7 seats, aluminum wheels, app-connect smartphone integration with Bluetooth, multi-collision braking, blind spot detection, remote start, 3-zone automatic climate control, an 8-inch touchscreen radio with a CD player, an SD card slot, and 8 speaker audio, a rearview camera, and more. 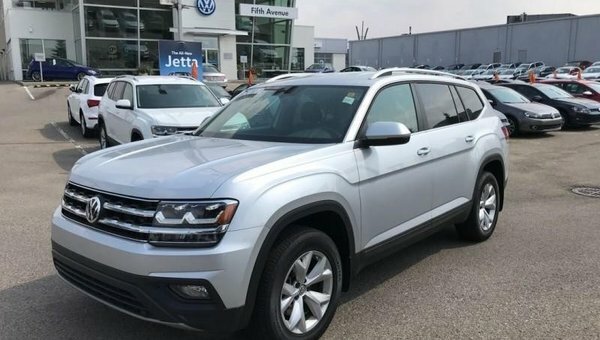 This vehicle has been upgraded with the following features: Bluetooth, Blind Spot Assist, Remote Start, Rear View Camera, Touchscreen, Aluminum Wheels. We've discounted this vehicle $4500. Buy this vehicle now for the lowest bi-weekly payment of $266.06 with $0 down for 96 months @ 4.99% APR O.A.C. ( Plus applicable taxes - documentation fee / Total cost of borrowing $11461 ). See dealer for details.